This pendant has a great deal of depth and color variation, with delicate washes of transparent color, dichroic glass, and my trademark swirls. This piece of layered glass has delicate scattered dichroic silver sparkles, and bright golden green with red accents. It's set in a sterling silver bezel setting with a ruffled backplate. This elegant pendant started out with a scrap of glass...a sliver...that I couldn't throw away. I fire-polished it into a cabochon, but had never thought about a design until a friend requested a commission for his wife's birthday. Sterling silver setting with a delicate dichroic dangle. Vitreous enamel on a copper circle, set in a sterling silver and fine silver bezel setting. This pretty little necklace is a prototype of a design that I've come up with for my mother, who has difficulty opening a back clasp. This tiny pendant is so delicate, but an example of my explorations into 3D modeling and printing. 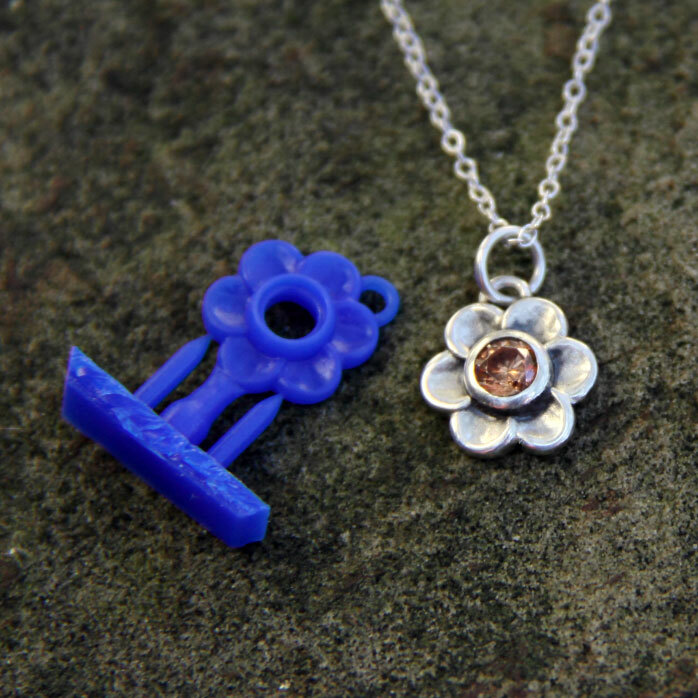 The model to the left is produced on a Formlabs Form 2 printer in castable resin, which is then cast in a traditional "lost wax" method. 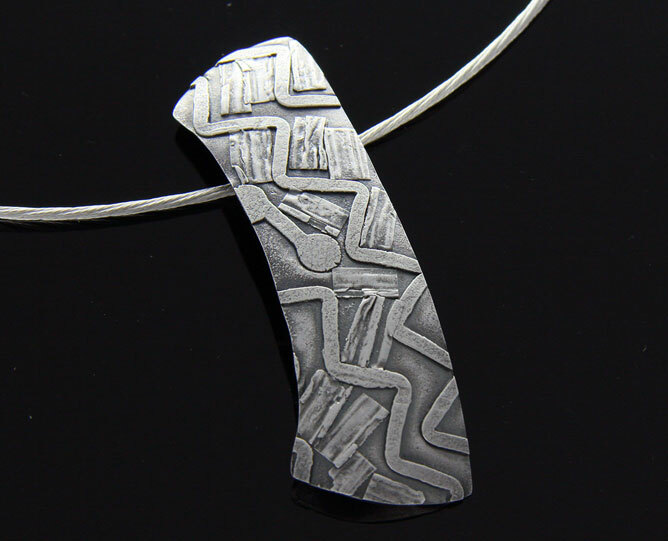 This piece features a custom etched "Zentangle™" fine silver piece, which was then enameled in a Basse Taile style. It was then set in a bezel setting on a "ruffled" backplate. This piece was part of a tutorial I created for Wubbers University. This enameled piece on copper features fold forming, with transparent enamel in a framed prong setting. A selection of my layered glass cabochons. These pieces were also photographed with a macro lens and printed on large canvases. This rounded triangle in dichroic glass has a clear glass "cap," which gives depth and protects the dichro coating on the glass. It has a heavy backplate with a square wire frame. Fabricated. This "art deco" piece has an exquisite piece of my layered glass with delicate ivory swirls. Washes of blue and green aventurine give the piece subtle sparkle. This pendant is created by fusing silver wire and elements to a sterling backplate. The piece is then hammered and shaped into a gentle curve by hand. These unique pendants feature different focal elements—some are enamel on metal, and others are layered glass. And others are natural elements, such as golden ammonite in the Framed Ammonite pendant. I'm fascinated by layered glass...different glass elements are prepared and arranged in playful mixes of reactive colors, dichroic glass, and washes of transparent colors. The glass is then carefully cut, and set in a sterling silver bezel or prong settings.